This national park is on the western side of the island, extending from Haleakala’s summit to the Kipahulu coast. It covers nearly 33,270 acres, over half of which is wilderness. 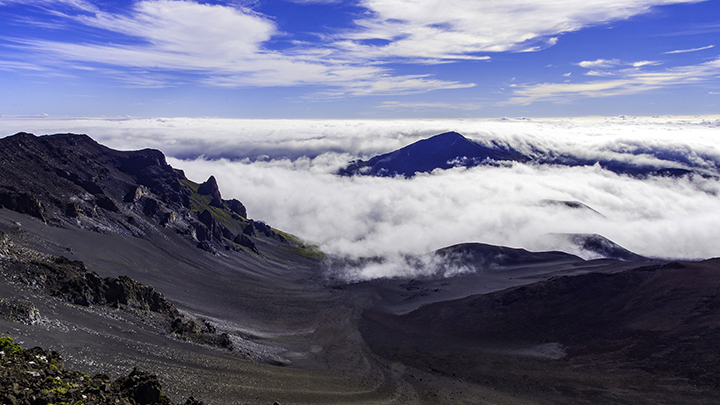 On the clearest days, five Hawaiian Islands are visible from Haleakala’s summit. The terrain is as varied as a region can be. It ranges from the barren volcanic crater to lush foliage, bamboo forests and coasts. The 2 hour drive to Haleakala summit has many ecological zones as on a drive from Mexico to Canada. There can be as much as 120 inches of annual rainfall here. Haleakala National Park’s temperatures can have extreme fluctuations. Haleakala National Park offers many activities that explorers will not want to miss. Star-gazing on the summit of Haleakala offers clear views of the Milky Way. At the summit, you can also watch the sight of clouds dissipating below you after sunrise. Haleakala offers some of the best hiking on the island. In Kipahulu, trails will take tourists through waterfalls, rugged coastlines, streams, forests and swimming holes. Here, there are ranger talks and guided hikes making exploration informative and educational. You can also hike into the crater over volcanic cinders and marvel at their amazing colors. There are a variety of trails, ranging from brief walks to multi-day endeavors. The elevation as well as the temperature can subject hikers to feelings of dizziness or nausea. Kipahulu Gulch area of Haleakala National Park. Campers can backpack through the park and sleep under the stars. Or they can choose fixed camp grounds like Hosmer Grove or the site at Kipahulu. The National Park Service also maintains three strategically placed wilderness cabins in the park. These offer hikers a place to rest and sleep along an extended journey. Travelers must book these cabins in advance. Distances between the cabins range from 4 to 9 miles. So hikers must be prepared to trek these lengthy trails. As the cabins are without supplies and electricity, campers must bring food and water with them. Groups can stay no more than two consecutive nights in any of these cabins. Each cabin costs $75 per night and can accommodate up to 12 people. For more details about the cabins, talk to the rangers at the visitor center. There are no public transportation and gas stations within the National Park. So drivers should refuel in the towns of Pukalani or in Hana if they are low on gas. While hiking near the summit, you might see the Ua’u Hawaiian dark-rumped petrel, a sea bird that eats squid. So if you see piles of squid beaks, you will know the beautiful bluish birds are not far. There are special events about the many rare species living in the national park. One such example is Nene (Hawaiian Goose) Awareness Day on September 26. This is the park’s event to increase public awareness of the endangered state bird of Hawaii. You will either need a National Park Pass or pay a fee to enter. Also, there are cultural workshops and activities at the summit and at Kipahulu. You can obtain park information at the visitor center. The park is open 24 hours a day 7 days a week, except during extreme weather conditions. This State Park is just west of Wailuku at the end of the Iao Valley Road. 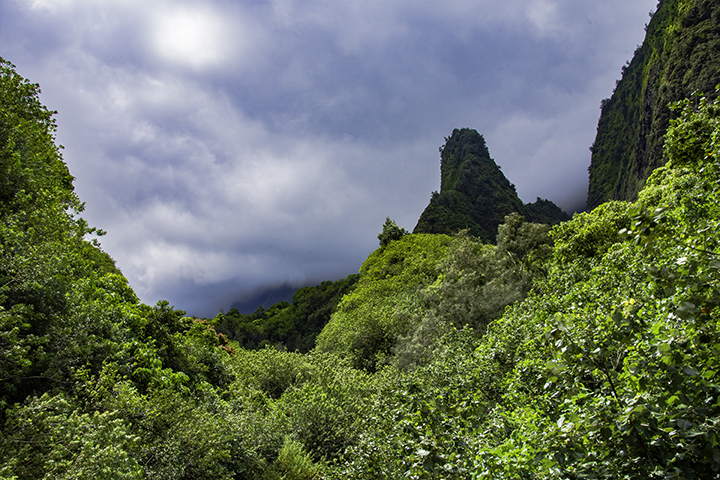 The park extends 4,000 acres across 10 miles and prominently features the 1,200-foot tall Iao Needle peak. There is an entrance fee of $1 per walk-in and $5 per private vehicle. The park is open daily from 7:00 am to 7:00 pm. The terrain has dense forests and underbrush. It is an area of historical significance as Iao Valley was the site of a major battle between warring chiefs. There are also lookouts offering panoramic views of Iao Valley. This state park could be the second wettest place in Hawaii. Visitors can tour a botanical garden to see some of Hawaii’s rare and indigenous plants. Iao Needle is one of the most famous features of the state park. Hikers can climb 133 steps to the highest point for a full view of the valley. The park is the location of the 1790 Battle of Kepaniwai. This is when King Kamehameha I fought Maui’s warriors in an attempt to unify the Hawaiian islands under his rule. During the battle, warriors used Iao Needle as a lookout point. In spite of the Maui warriors’ brave efforts, Kamehameha I won the battle and brought the island under his control. This battle changed the course of Hawaiian history. Nearby is Kepaniwai Park’s Heritage Gardens. The exhibits here tell the story of Hawaii’s diverse population. There are models of missionary buildings as well as those from Chinese, Japanese, Korean, Portuguese and Filipino cultures. Here, people can wander through a children’s education center and learn about the valley’s history. View of the Keanae Penninsula from Kaumahina State Wayside Park. The Kaumahina State Wayside Park is on the northeastern coast of Maui and spans across 7.8 acres. Visitors can arrive at the park from the Hana Highway, 28 miles east of the Kahului Airport. There is no entrance fee and the park is open from 6:00 am to 6:00 pm daily. Kaumahina is a coastal park, with scenic views of the beach and coast. This park has forest areas, picnic tables and trails with views of the ocean. Temperatures are pleasant year round, although you should expect regular rainfall. Travelers will enjoy this picturesque pit-stop on the Hana Highway. There are numerous looping trails to the ocean. 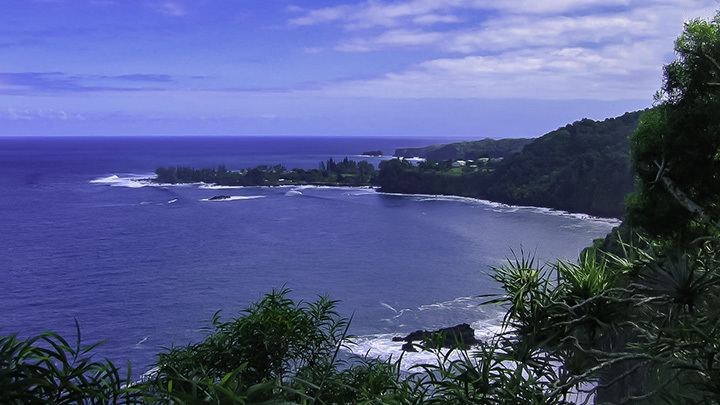 The trail’s lookouts offer views of the Ke’anae Peninsula and the northern coast. You can make inquiries about the area’s wildlife at the park office. There is no drinking water available here. So visitors should bring their own. Makena State Park is on the south shores of Maui off Makena Road. The state park is open from 6:00 am to 6:00 pm and there is no entrance fee. Makena is mostly a beach park of 164 acres of glittering coastline. Lava outcropping separate the areas of “Big Beach” and “Little Beach.” Off Makena Road stands Pu’u Olai, a 360-foot dormant volcanic cinder cone. Often, the “Makena Cloud” covers a wide area from these two beaches across the Alalakeiki Channel to the neighboring island of Kaho’olawe. Travelers come to Makena State Park because of its wide coasts and expansive sandy beaches. Big Beach stretches 1.5 miles long and is over 100 feet wide. This provides a lot of space for sunbathers to enjoy the sunshine and surf. Little Beach is only about 660 feet long. Here, you can enjoy a brief 5-minute hike up to the top of Pu’u Olai, which divides the park’s two beaches. Here, people should only enter the ocean on days when the waves are calm. This is because the currents and shore break can be extremely dangerous. Only when waves are not rough activities like body surfing, boogie boarding and surfing be safely enjoyed. The beach does not have restrooms or drinking water. View of east Maui shoreline. Image by Dexter Freitas. 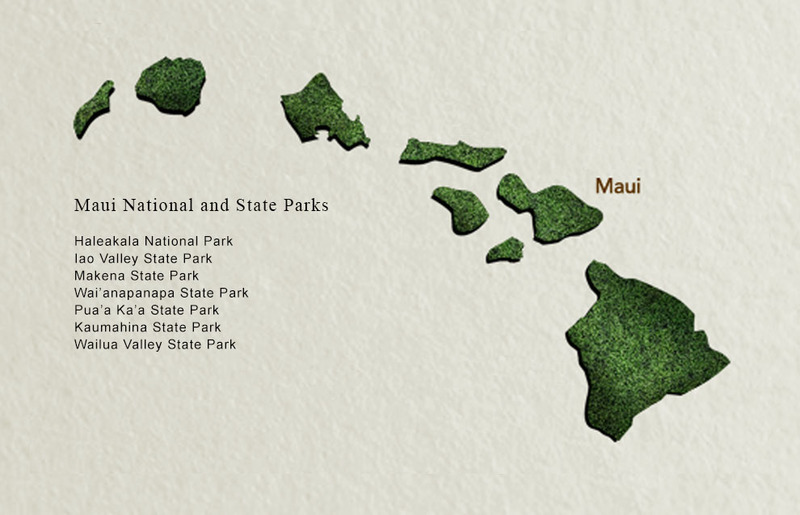 Wai’anapanapa State Park on east Maui is 53 miles from Kahului Airport. The park extends over 122 acres and is open daily without entry fees. Wai‘anapanapa State Park is a coastal park of rocky volcanic hills and cliffs above the ocean. There is a hala tree forest, blow holes, stone arches and one of the iconic black sand beaches of Hawaii. Wai‘anapanapa means “fresh glistening water” and the streams and pools of the area reflect this. Visitors on the Hana Highway should consider Wai‘anapanapa State Park an absolute must-do. One of its most famous attractions is Honokalani Beach black sand beach in Pa’iloa Bay. Because the black sands burn hot in the sun, it makes the water even more appealing. However, tourists should be aware that swimming can be very hazardous in this area. While one should definitely not swim here, there is plenty of fun that can be had at this beach. You can explore the area’s caves or just take in the scenery of one of Hawaii’s most stunning coasts. Hikers should exercise caution while walking on lava rocks to access the blow holes, pools or wet caves. The area’s wet caves are an interesting place to explore. 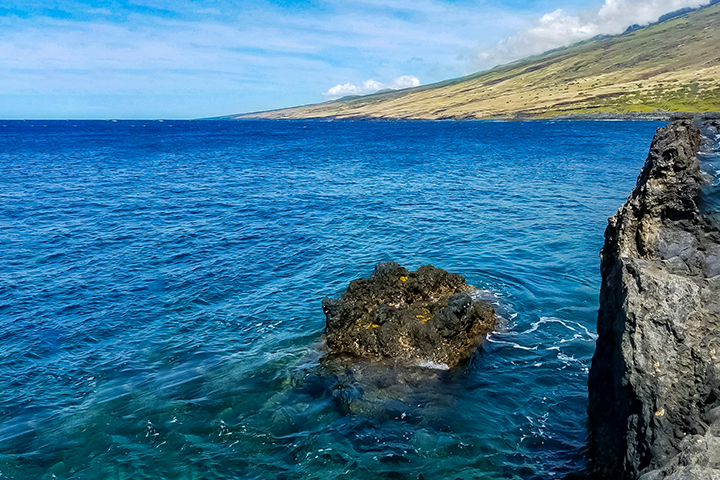 According to legend, the wet caves are where Popo’alaea, the wife of Chief Ka’akea, escaped to avoid his beatings. The chief searched for her, saw her reflection in the water of the caves and killed her. The pools forever represent a memorial of this tragic tale. You can take a step back in time on the ancient trails in Wai‘anapanapa State Park. The King’s Trail takes you to historic Ohala Heiau as well as to other caves and burial sites. Vacationers can also pitch tents or rent cabins in Wai‘anapanapa State Park. Additionally, the park offers restrooms, drinking water, payphones and showers for day visitors and campers. Pua‘a Ka‘a State Wayside Park covers 5 acres off Hana Highway, after mile marker 22 and 38 miles east of Kahului Airport. This is a dense forest area with small pools and waterfalls, picnic tables and a rest stop. This park offers short walks on paved trails, leading to small waterfalls and a picnic area. There is a dirt trail that crosses a viaduct and leads to a larger waterfall. 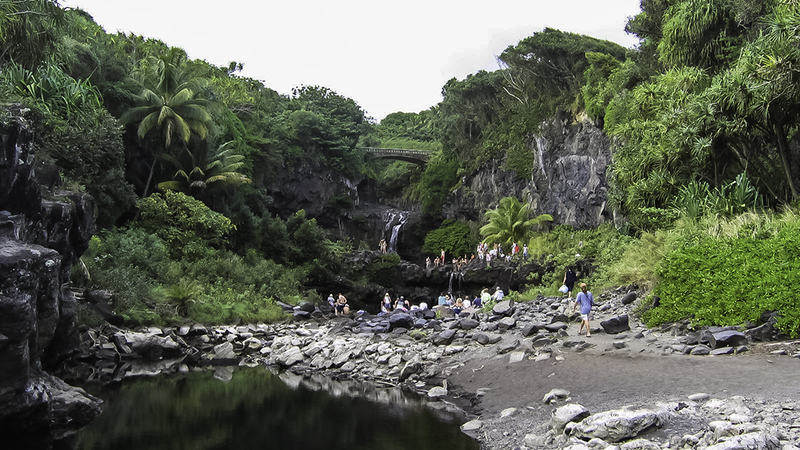 For families who would like a scenic break on the Hana Highway, Pua‘a Ka‘a State Wayside Park is the perfect place. There is a parking area and restrooms for travelers’ convenience. There is no drinking water. So visitors should bring plenty on their drive to Hana. The Wailua Valley State Wayside Park is on the Hana Highway, around 32 miles from Kahului Airport. This area is less than 2 acres and is open daily without a fee. The park provides a good view of the taro fields in Wailua Village, coastline and Ke’anae Valley. This is another great stop for those who need a break and want a view the surrounding landscapes. This park offers a spectacular view of Ke’anae Valley. And from a lookout, you can see Wailua village as well as the stunning blue ocean. This park provides no running water or restrooms, but has one of the best panoramic views of the nearby areas.